This is a view from Fort Rodney at Pigeon Island National Park in St. Lucia. I grew up very close to this location, and I often do this hike when I go back to visit my parents. Long before it became a National Park it was a popular place to go for a “beach picnic” with family and friends. We would hang out all day at the beach, in and out of the water (and in my case, reading under a coconut tree). While the adults sat around drinking rum and playing cards or dominos, the kids would go exploring. The look-out point at the highest part of the island just had an old, shaky ladder in those days and it was quite scary climbing up or down, but the reward at the top was a fantastic view. Which is why there are also a couple of old cannons up there. I encourage you to read this article about Pigeon island, it has some very exciting history of the place which includes pirates, battles (St. Lucia changed hands between the French and English 14 times) and even a period when the island was owned by an English actress (my Mom and her friends remember having to row a boat out there to go to parties). That was before they dredged up the sand and created the causeway joining the island to the main land. The more I think of it, the more stories I have about this place. I even went there to take pictures on my wedding day. 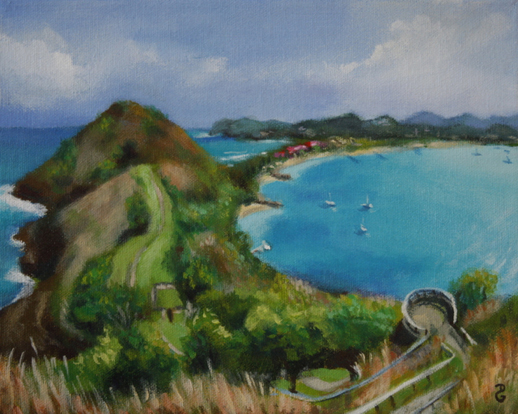 The red roofs you see in the painting are those of Sandals Grande St. Lucian Spa & Beach Resort, which attests to the beauty of the location as well as to its popularity. If you’re ever visiting St. Lucia, I recommend Pigeon Island National Park as a great place to spend the day, or even a couple of hours.